Spent a little time today to show a couple people some tips on teaching direction commands and just some general basic skills for cowdogs. We worked on “away to me”, “come by”, “there” and “get ahead”. 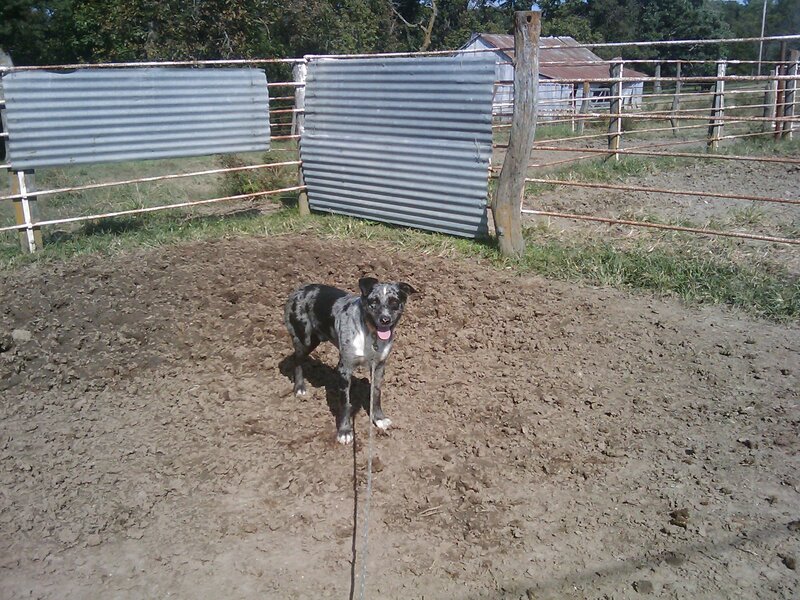 I like to use the corral for general ground work training sessions. 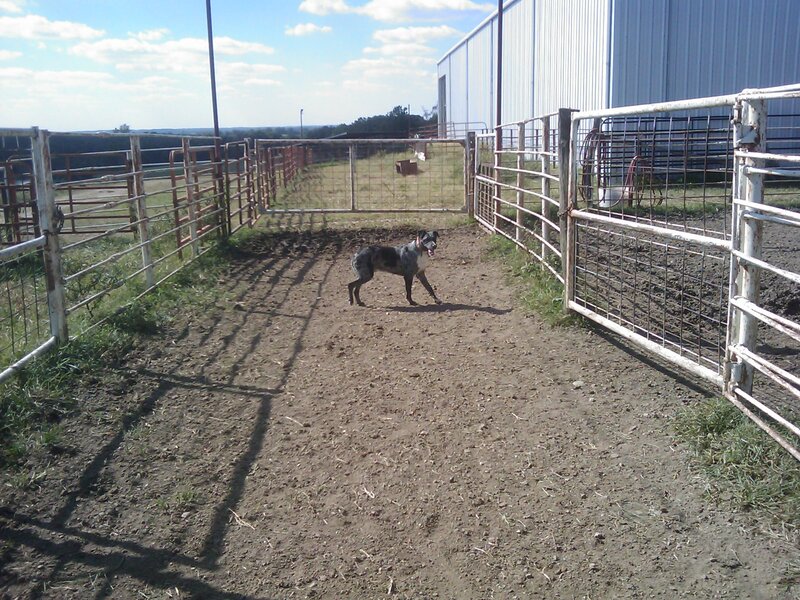 It simply puts a “familiar” feel to the training session for the cowdog when they are young and just getting started. It is where he or she is going to be spending part of their work day so it gives them a chance to get comfortable with their surroundings. 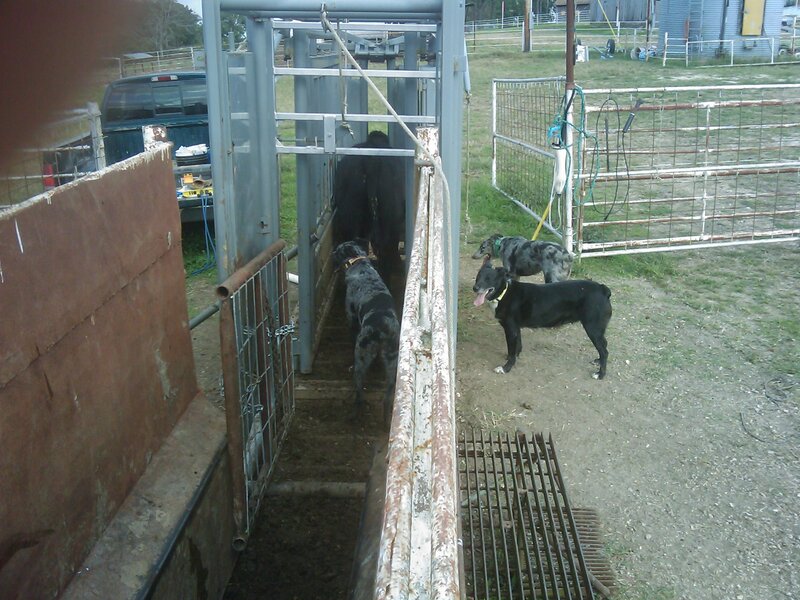 We work on getting comfortable with gates opening and closing; clang and bangs of gates and latches; catch and release sounds of the chute head gate; and general positions the cowdog needs to be in as you work together as a team. I took a few pictures to send home with the folks and thought I’d share a few of the photos here. We had 70 hd. of Spring calves to process this afternoon. Hawk and her kids…Bandit and Ducchess…were on duty today. We vaccinated with Express 5-PHM and Vision CDT, Valbazen drench, weighed and put in some EID and panel tags for the feedyard. Had to dehorn two. We got along great. It is nice to have good cowdogs that can handle the gathering, sorting, loading the alleys and just be all-around good partners and friends. No wrecks, no messes, just another day at the office! Additional thanks go out to the people that have sent kind wishes to me regarding my loss of Bert. I have met some super folks who read Beef Magazine and Drover’s Journal. 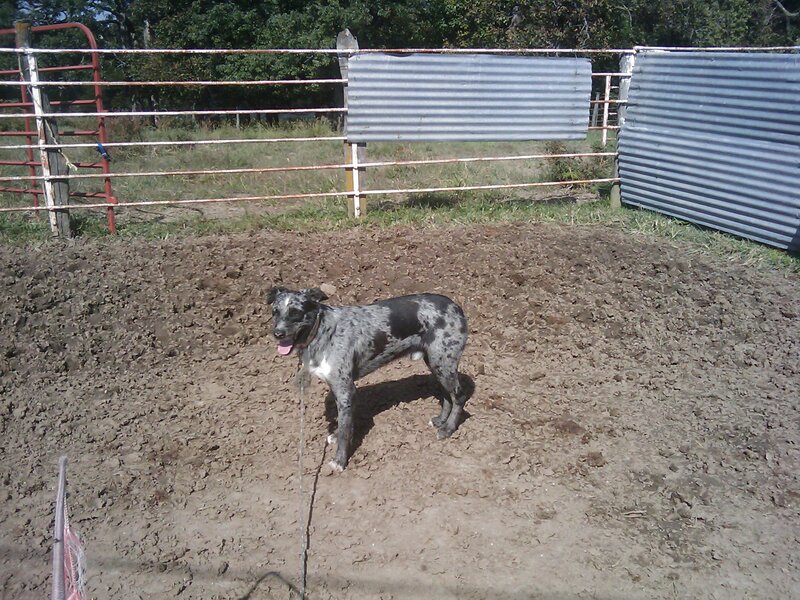 And thanks to those of you who have seen my banner ads and called about my cowdog program. Bert met a lot of good ranching, farming and feedlot folks when they saw ads about his cowdogs (his kids) here at our place. Thanks alot and we look forward to your visits in the future. 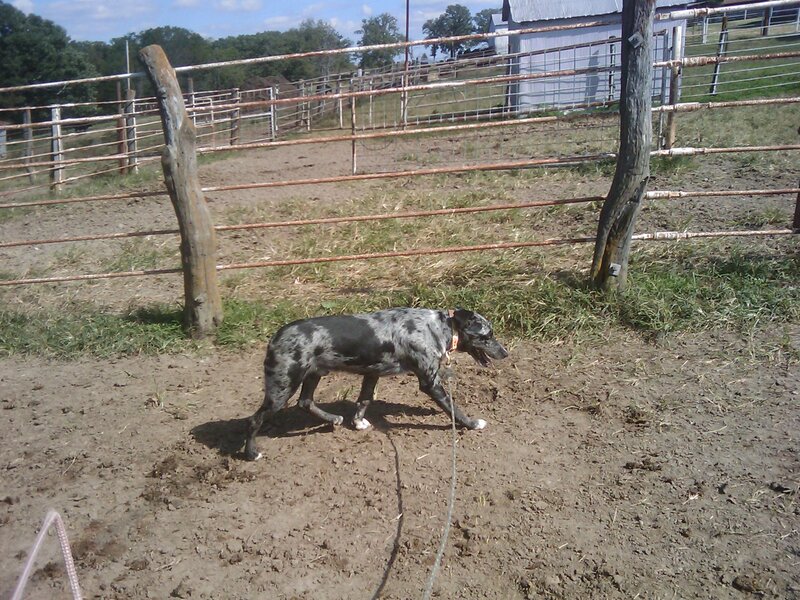 I have resumed scheduling dates for private lessons for cowdogs and handlers. I appreciate all of you for allowing me time to get back on my feet, so to speak, since the loss of Bert. I will be taking a limited number of students for afternoon sessions. These will all be private sessions for each cowdog and handler. I have decided to not have the fall gathering for handlers and cowdogs. Private sessions will give us the opportunity to do actual hands-on work with cattle processing. 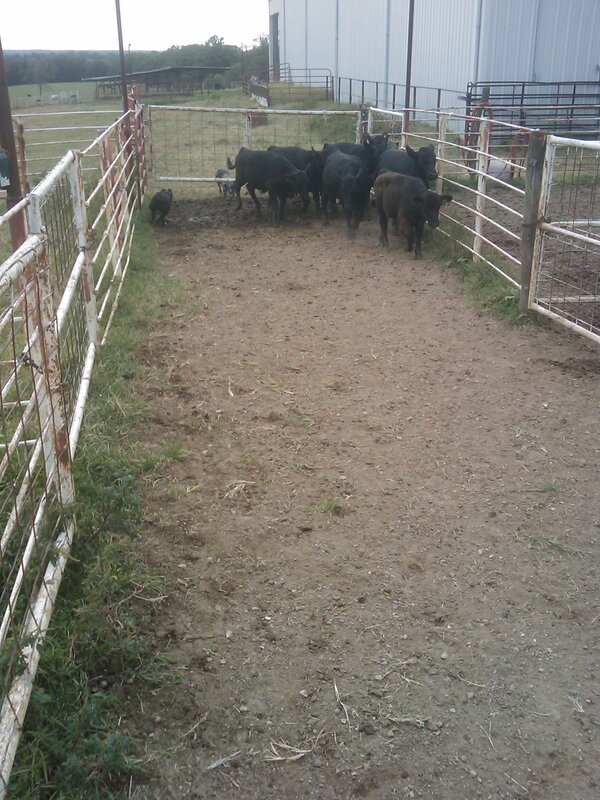 The sessions will be 2-4 hours depending on the cattle work that needs to be accomplished. The best way to contact me is e-mailing me a message or calling my (H) 573-782-4912. Please leave a message and I will get back to you. 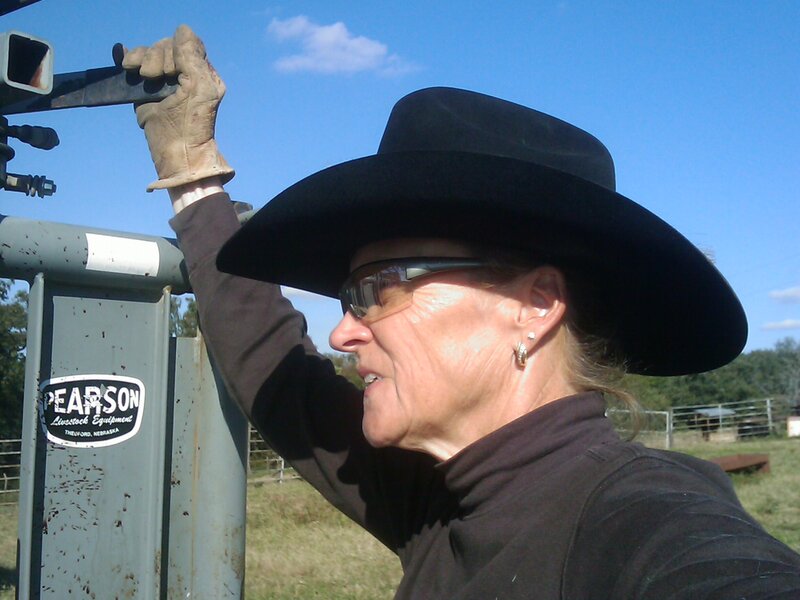 I leave early and get home late….it’s just the nature of ranching. I am fall calving now and have some spring calves still here in the grow yard. So, we are busy. I’ve lost enough cell phones over the years that I don’t always have it attached to me! Having a cell phone ring while I am tagging a calf is just a noise I don’t need. With Bert in our hearts, some of his kids are now taking the reins to learn the ropes of calving season. I am using Ducchess, Bandit, Levi and Luke to go along on checking the cows and calves. It’s best to get them schooled on the finer details of calving chores now so that when it is below zero, snowing or icing, we will have the routines down. The cows are used to seeing Ducchess and Bandit and don’t get antsy or uptight. 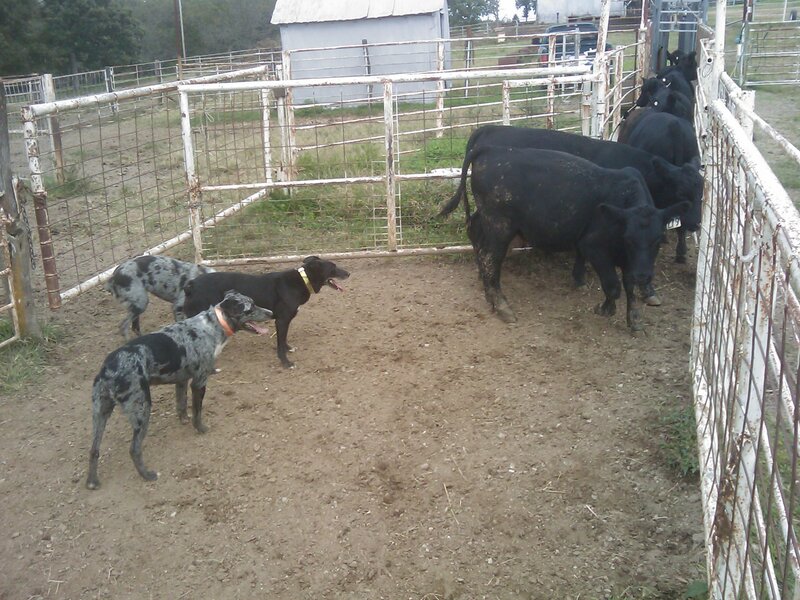 But, Luke and Levi are solid colored cowdogs and carry themselves with a bit more speed and alertness in their stride, so the cows are still a bit uptight when I take Levi or Luke along. 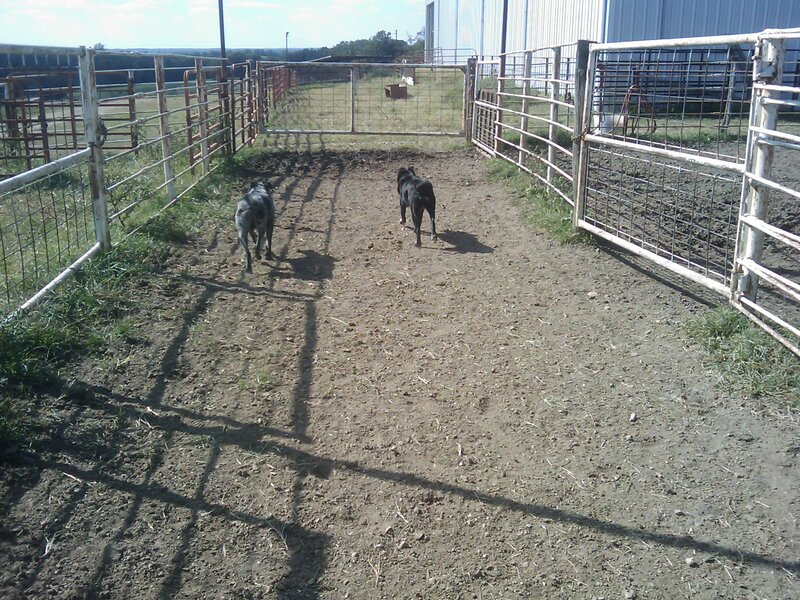 The trips through the cows are good for the cowdogs. It gives them the ability to be calmer and more confident in being “still” around the cows with newborn calves. Bandit and Ducchess are doing a good job of quietly holding a cow’s attention while I move in to tag or weigh a calf. We have not had one wreck. Now Levi on the other hand got a first calf heifer pretty snorty the other day. She was wanting to freight-train him and I wanted him to simply hold his ground and not try to take her head off! We got through it fine, but ole Levi’s heart was about to jump out of his chest. 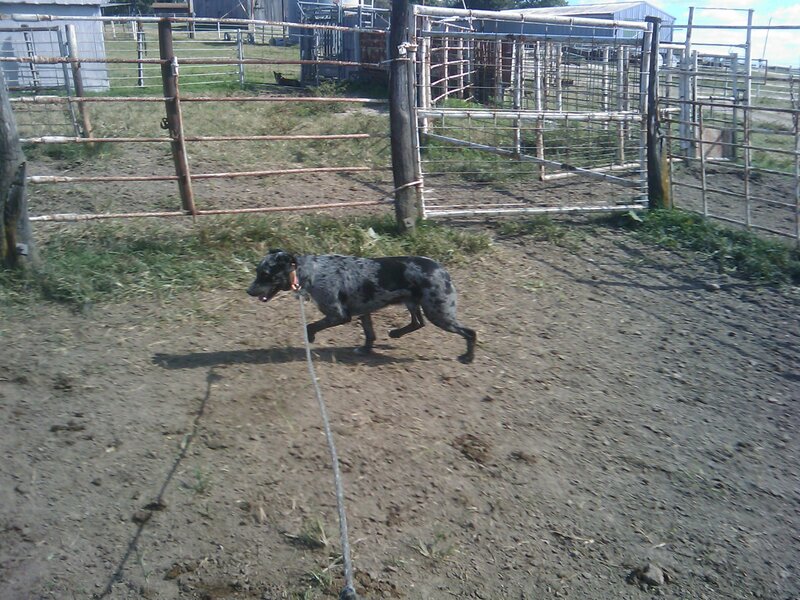 Today, Bandit had his first solo job of taking a cow home so that we could pull her calf. Only one foot was showing. She gave him the, “I’m not going” routine and we were about a mile from the corral. He gave her a few good heading moves and she decided to head on out in the right direction. I stayed back out of the way and gave Bandit some encouragement to keep her moving forward. About 1/2 mile from the corral, Bandit had to take her through about 70 other cows. He held his ground and got her to move on despite her attempts to give him the slip. 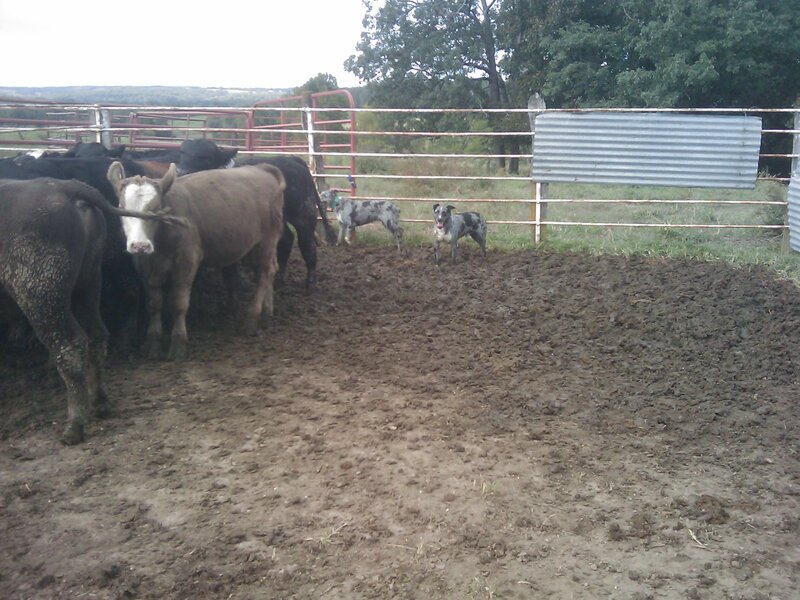 It really is good to see a young cowdog that can hold his composure and be patient to work through a tough situation. Bert really enjoyed Bandit and Bandit really looked up to his dad. I can see a lot of Bert in Bandit. Bert would have been proud of his son today! A special thank you to Bill Frank and ADM Alliance Nutrition for the kind visit and words that you shared with me today about my business partner and best friend Bert. Bill is a beef cattle specialist with ADM and we have worked on developing a lot of different products over the years for beef cows and calves on range. With Bill’s support at the company level, he has taken some ideas back to his inside specialists and we have created some cost effective and highly beneficial products. 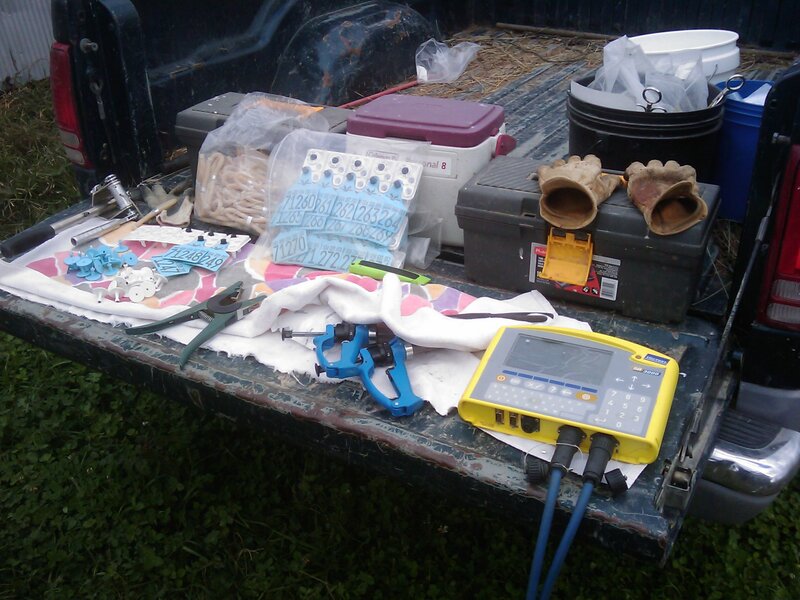 My cattle mineral program is very simple. Endophyter (citric acid presscake, aka Citri-Stim) loose mineral with Availa 4 and Red Mintrate Blocks with Rumensin. My weaning and developing rations for calves incorporates the ADM Prosponse (yeast) and Prosponse Nutrium to build healthy immune and digestive systems. 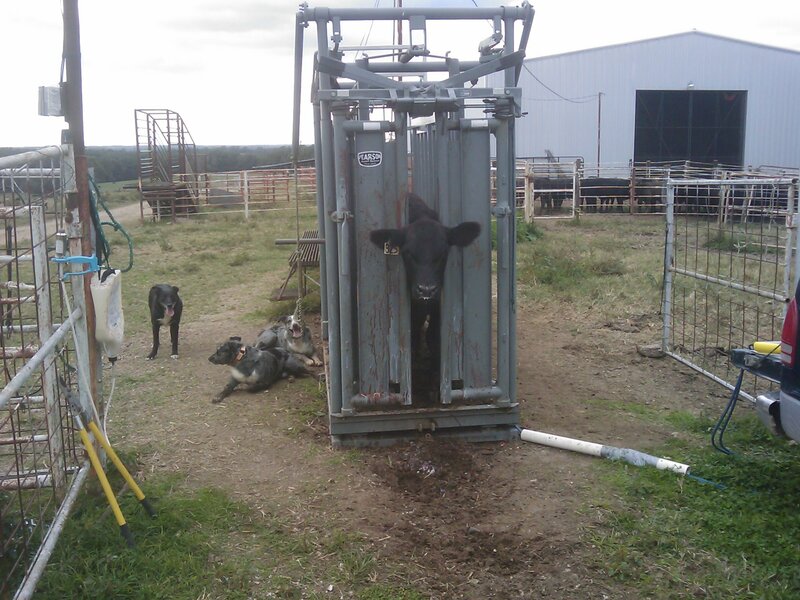 I treated one calf for a runny nose out of 200 head back on September 5, 2010. My fall calving heifers and cows are shelling calves out at a fast pace. No retained placentas, no scours, perfect amnionic fluid color. The ADM mineral program I use is extremely cost effective and the results speak for themselves. We like the simple approach in life. Thanks again Bill for remembering Bert today. Today, via UPS, I received a wonderful tribute and rememberance gift for Bert from Purina Mills and Exclusive Pet Foods. Joe Abbott is the lead person responsible for taking care of my needs in my cowdog and beef cattle programs. Joe is a true professional in his work and an all-around good friend. His article on my News Page on my website and the Purina Producer Profile in the last newsletter are a testiment to his desire to help production agriculture operations. Bert really liked Joe and always welcomed him with his trademark “wiggle” and “hello smile”. Joe, thank you for the memorial plant for Bert’s grave. It will fit right in with the Buffalo Grass and Lead Plant.